Brian "Fountain arrived, looks fantastic - will be trying it out soon. Again, fantastic piece of art - Thank you - Enjoy the New Year"
Krina Laverda, Ozone Park, NY "Hi David, I received my fountain today, and it is truly a unique piece of art! I love it, and the soothing sound it makes! It is very relaxing, and you don't hear the vibrations of the pump at all. Just the flow of calm and serene water! I absolutely adore the rustic look! It fits in to my decor perfectly! It was worth the wait! Thank you for your wonderful creation!" Randall Nelson, Parker, CO Hello David, Just a quick thank you for keeping me on your mailing list. Our Tree of Life fountain has been the centerpiece of our patio the last two summers. The copper has aged to a beautiful deep color although I liked the bright color when it was new just as much. The hummingbirds and goldfinches have been happy as well -- often four birds at the same time will drink or bathe within the "leaves". Next summer we will probably add another fountain of yours to our yard as the sound of water has been so welcome during the hot, dry weather this year. 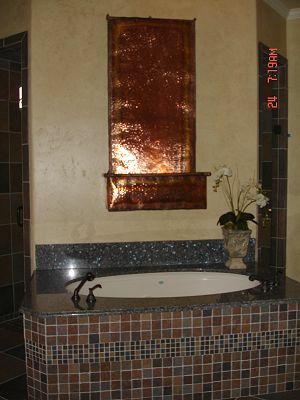 Tina R, Pensacola, FL David, I received the beautiful copper fountain late this afternoon. It is just perfect and just what we wanted. I love the way you fluted each one of the leaves to give them so much character. I am so pleased I found your website. 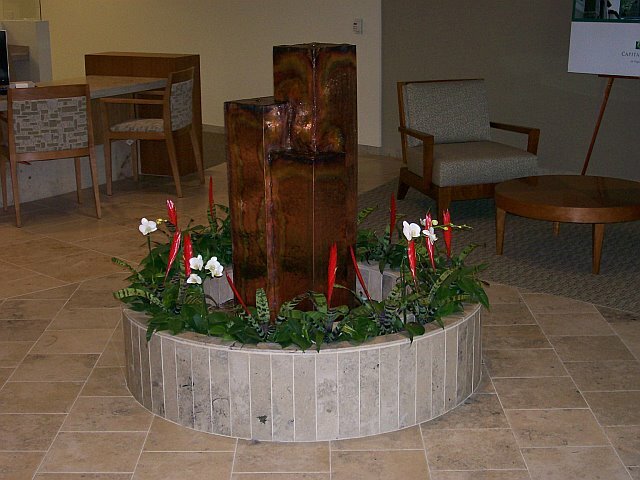 No wonder you have so many beautiful commercial fountain installations -- your work is equally impressive now that I personally have one of your creations. Many thanks. Maria Anderson, Bend, OR Hi David, Got the fountain up and running and I love it!! The sound is perfect and it looks great at night with the light on. Thanks again so much! Andrew Gardner, Haddonfield, NJ David, We've had our Tree of Life with Planter for seven years now and it's as special for us as the day we bought it from you in New Paltz, NY. 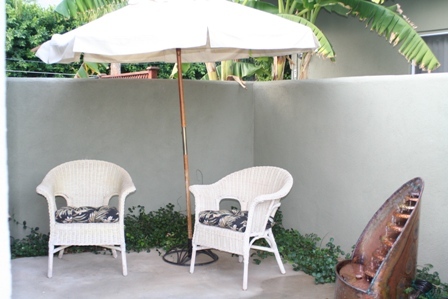 We keep it in our Family Room and our guests often comment on how beautiful and relaxing it is. Over time, the copper has aged and oxidized with various shades of green beneath the water--this only enhances its natural beauty! Thank you for creating such a lovely piece. Steve Sandberg, New York, NY Hi David, The fountain arrived today - I absolutely love it! Just set it up and it has completely transformed the energy in my over-computerized workspace - will probably order another one for my bedroom in a day or so - Thanks so much! Nancy Murphy Phillips Optical, Northaven, CT The fountain is gorgeous!! I could not be happier with it, David. Everyone who sees it remarks on its beautiful design and lovely sound. I will send you a photo of it in its new surroundings as soon as I come up for air - it has been a marathon getting settled in and up and running at the new place. Many thanks and blessings, Nancy. Tim and Lisa Goodman. 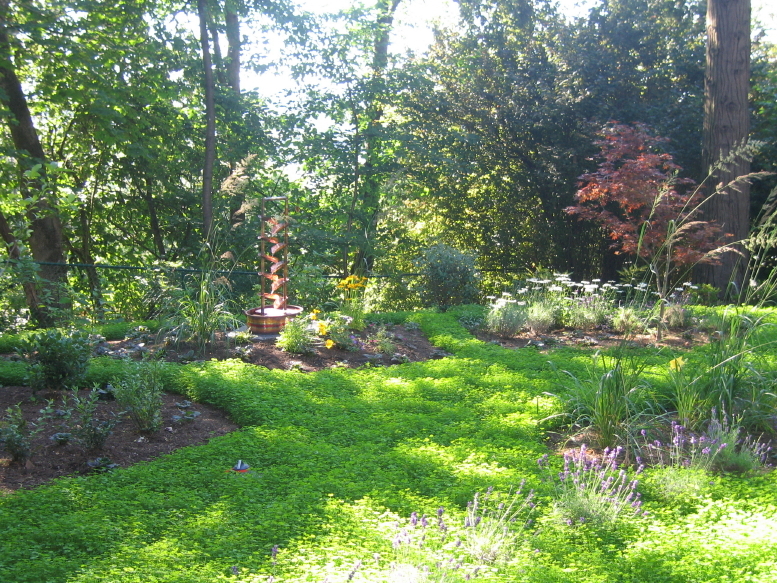 Goodman Landscape Design Berkley, CA. ; 10' Mother and Children The single parent family is operating, lit and...most of all, simply stunning. Given the context and scale of it's surroundings, I cannot imagine a more perfect piece. Tonight I met with the client (Michael), architect (of the interior-we were the landscape architects) and lighting designer. The vote was unanimous. The piece is perfect. Thank you for such a beautifully designed and executed piece of art. It's inclusion into this very special garden has not only made it complete but has helped transform it into something truly exceptional. 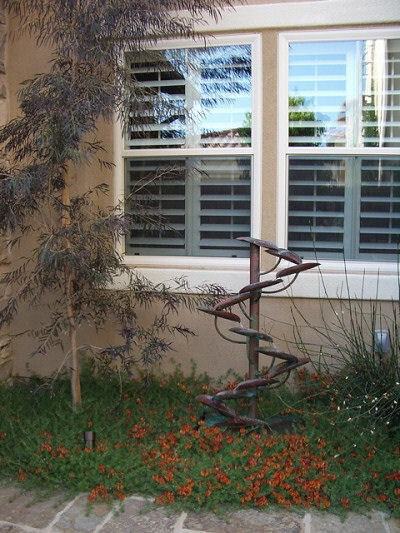 Denise St.Onge San Francisco, CA; Water Trellis We received the fountain and it is wonderful! And we were really pleased that it arrived so soon. Thank you so much. 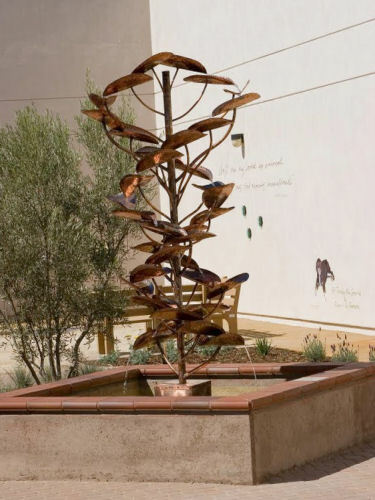 Ann and Marty Westreich, Manhattan Beach, CA; Tree of Life David -Well done! It's everything we hoped it would be and more! 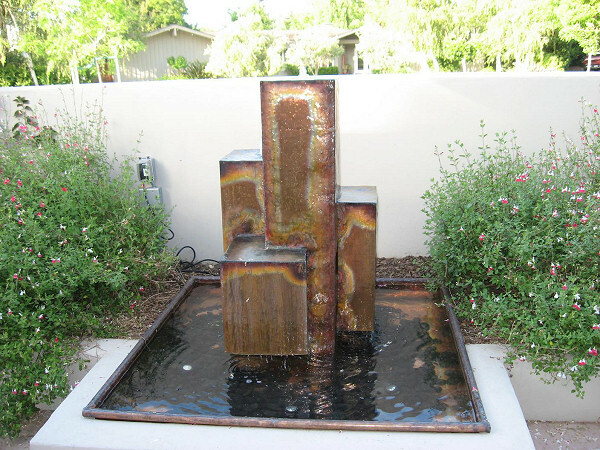 Lyn Sattazahn Phoenix, AZ "David, I received my fountain today and it's just beautiful. I couldn't be happier with it. Thank you so much." Jeri and Alan Greenfield Hilton Head, South Carolina "We're really enjoying the fountain. The sound of the water is very soothing and it looks great with the lights on at night. It's everything your website promised and more. Thank you." Pat Williams The Inspired Heart, Vero Beach, Florida. 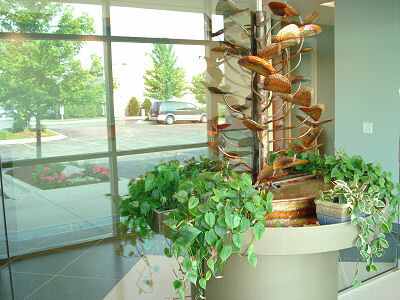 "Dave - the Tree of Life fountain we purchased from you is stunning! A BIG thank you for sending the fountain so quickly and absolutely making our Grand Opening day a success! The level of service and workmanship you provide is very rare today. Our customers always comment on it. 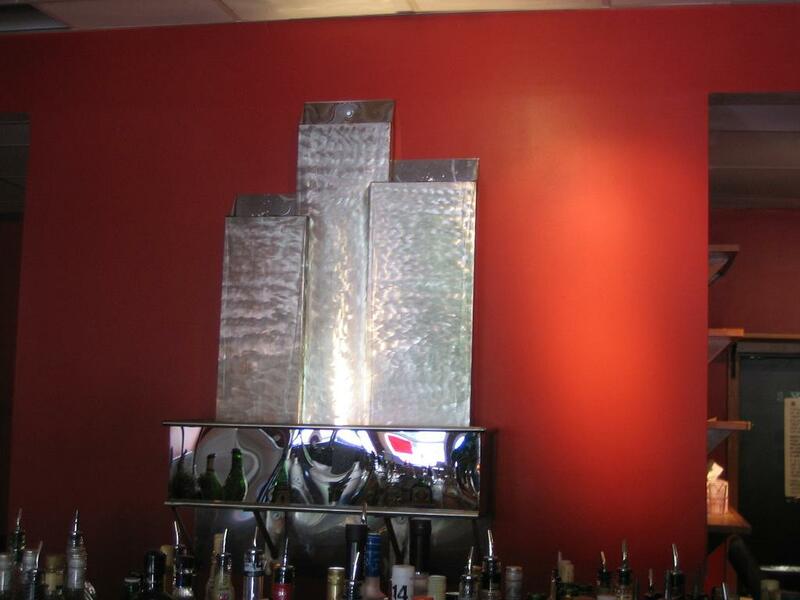 Our fountain is everything and more as described on your website. Blessings to you." Dr. Donald Binns Boulder, Colorado. "David, It is a pleasure to do business with you. You must have been born a generation late as, unfortunately, your approach to customer service is no longer the norm. But we appreciate it and if you ever need a reference or something else, let us know. We will always do the "Tom Bodett" for you and keep the light on in the window. Thanks for the wonderful fountain." Lynn McGlone Seattle, WA. "Oh My Goodness David - it is absolutely stunning - the colors are brilliant - I can't wait to take it to the studio and fill it with water. I'll write you back later. 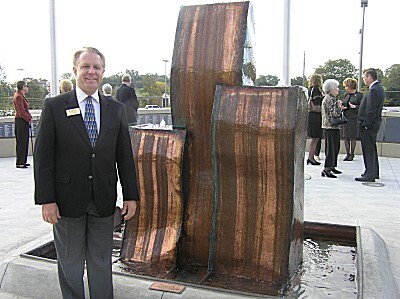 Namaste - many thanks for your artistic talent and your heartfelt concern for the fountain arriving in time. More later." Lynn McGlone, Seattle, WA. 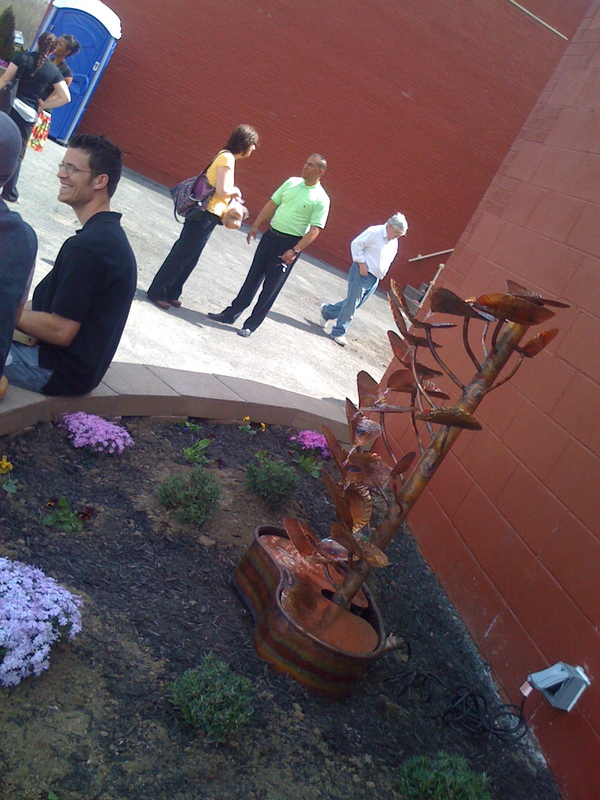 "The beautiful fountain arrived at my yoga studio in time for my grand opening. My students comment on the serenity of the soothing sound the water makes. 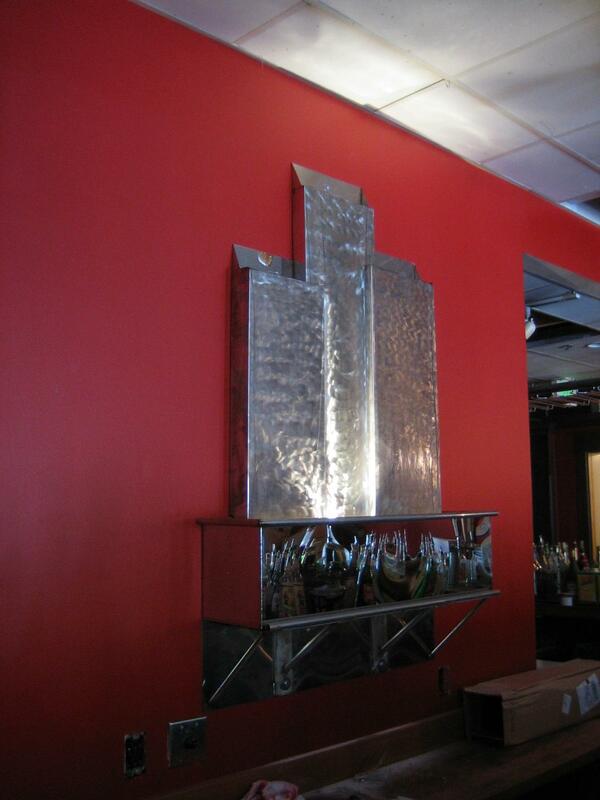 The artistic work in the design adds to the overall ambiance of the studio. David is a delight to work with and an impressive artisan. Many thanks." Ross Benthien, Houston,Texas. "David, I have been meaning to get you some photos and a comment, and have often thought of that as I look at the fountain. Everyone who sees it loves it. We are extremely happy with how it turned out - and how it and the landscaping complement the house.I was just relooking at your website and enjoying your custom work!" Russ Nesemeier, Phoenix, Arizona. "I'm getting good use of my fountain. I have added some plants alongside, decorated across the front with some of Arizona's rocks with the green copper residue. With that, at night, I have a yard low watt spotlight to reflect the waterfall. Looks great! I have gotten many nice compliments...Thanks. Cate Melcher Executive Director Children's Museum of Skagit County. Mount Vernon, WA. 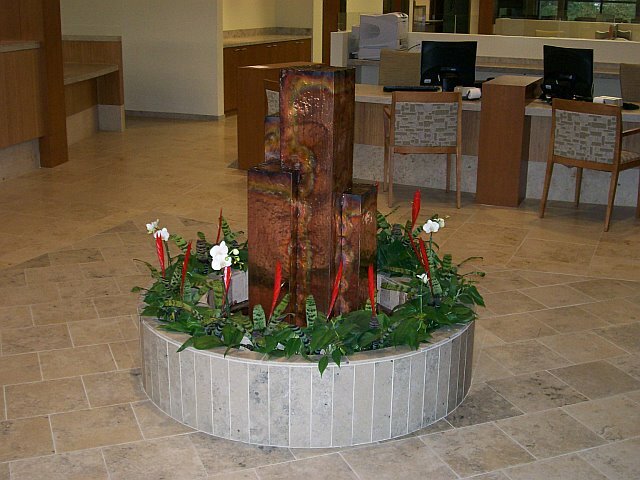 "Dear David, upon seeing and hearing one of your fountains in a display area, we knew that one of your creations would be the perfect complement to our Reading Area in the Children's Museum of Skagit County. Children and adults have been enjoying the beautiful and melodic fountain. It's great to see children stop in the midst of their activities to figure out the location of the lovely sounds. Hearing the water, which is such an integral part of our community, is a wonderful addition to our museum. Thank you." Phyllis Fitzgerald, By Hammer - By Hand; Mahopac, NY. "It's been great carrying some of Dave's fountains. The customers love hearing the sound when they come in the store!" Linda Love, Awakenings; Katonah, NY. 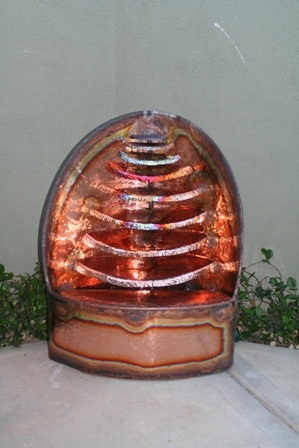 �David Perlman�s fountains create the most healing soothing sound! My customers love that it will last forever and the beauty of the craftsmanship." David Harding, Daybreak Nurseries; Westport, CT. �David Perlman is very reliable, easygoing and always willing to work with us without a problem. 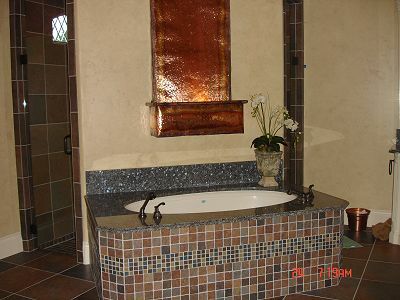 His fountains are a great product." Martin Alcock; Pure Source, North Salem, NY. �I have worked with David on several projects and have always found his work to be totally inspired. I have no hesitation recommending his company." Paul Tompkins; Transendence Spirituality & Serenity Shoppe, Huntington Village, NY. �I met Dave at the Denver New Age International Trade Show this past summer '99. I was instantly drawn to his unique and beautiful fountains. 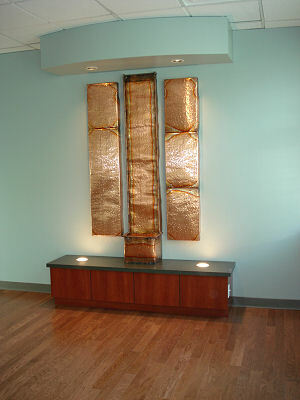 The copper construction adds a simple earthy quality which is very comforting. The sound they create was one which I wanted at my new shop. I opened my new store this fall and ordered three of David's fountains. He was very accommodating with getting them right out to me, which I appreciated. They add a very pleasing quality to the shop and are a perpetual topic of conversation and interest. It's nice to have an item which is not only a nice product to have for sale but becomes part of the experience of the shop as well." Colleen Gillete: New Paltz Travel; New Paltz, NY. 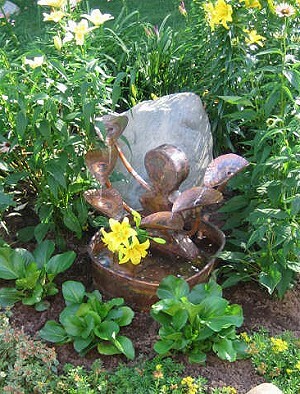 "I like our fountain because I think it is pretty, and I enjoy the serenity that I feel from it. The water-sound is calming in our busy office." Donald Shaw- Donald Shaw Interior Design; NYC, NY. �David Perlman�s fountain adds a mood of tranquillity in the midst of Manhattan"
Joseph Scharf; NYC, NY. 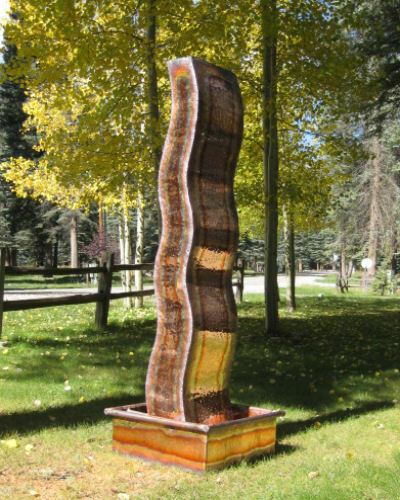 �As you already know, my initial motivation in purchasing the "Equilibrium" fountain was purely aesthetic. Clearly, this was accomplished, however, I had no idea how much the energy created by the fountain would impact my life. I am sleeping better, relaxing easier and my home exudes a serene atmosphere. Thank you for reading my needs! Best of luck and I hope you can handle all the requests that will undoubtedly follow." Jane and Greg Pike; NYC, NY. �Immediately we were drawn to the material and the sound. It was just so beautiful. We wanted the running water sound because New York is so noisy and loud. 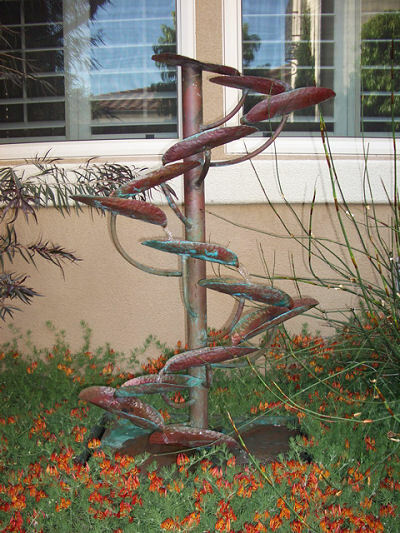 We had never seen a copper fountain like this, we totally fell in love with it. 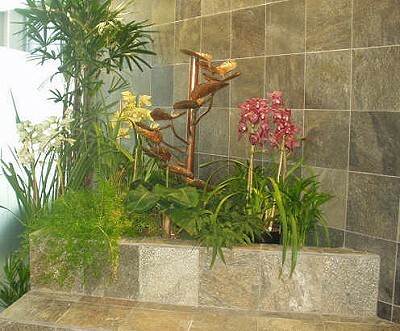 We have a newborn baby, and we use the fountain in the baby�s room to create a soothing environment." Dr. Buzzy and Phyllis Tischler, Woodstock, NY. 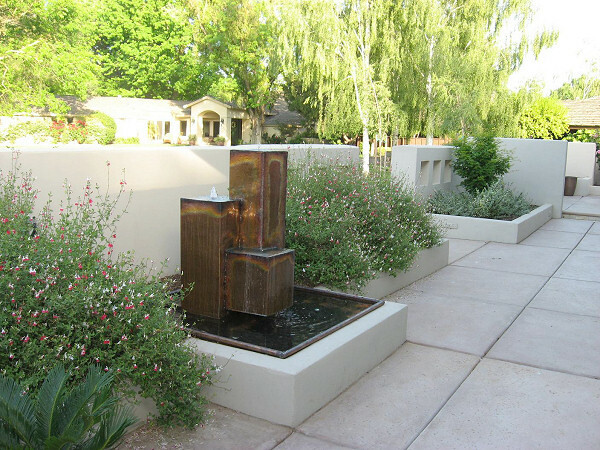 �We love our fountain, it is so beautiful with the running water sound. We have it outside surrounded by plants, it is the perfect marriage. We enjoy our fountain so much that we have since given one to each of our children as anniversary presents." 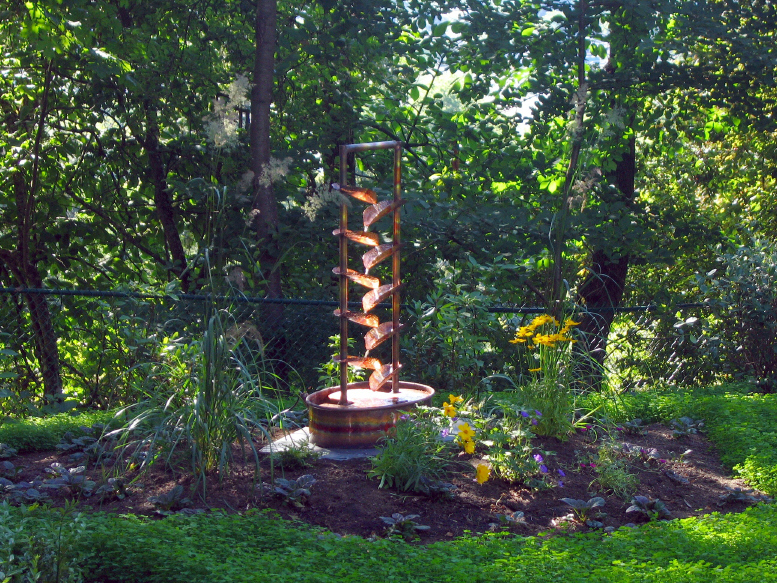 Cherie and Kevin Stiezel; Ridgefield, CT. �David�s fountains have brought to our home a sense of peace, warmth, and art." Mary Bryant; New York, NY. �David�s Fountain makes me feel very peaceful and relaxed. It Reminds me to slow down, and enjoy the simplicity of running water...which represents life." Bruce Parker; Woodstock, NY. �David's very apparent spiritual focus is reflected in his creations. A man who loves his work will always make his work his art." Rev. Heather Finck and Mr. Jim Soha; First Presbyterian Church, Metuchen , NJ. "We love our fountain and our cats love it too. The pump is nice and quiet unlike the fountains in most stores. I love the peaceful sound of the water. I lead adult Bible studies and spiritual growth groups and people always comment on what a relaxing influence the running water is." Dr. Rita Kirsch-Debroitner; Rhinecliff, NY. �I have several of David�s fountains. They bring a sense of harmony and peace to my home."